I finally got to my first game jam this year. I have wanted to go before but never took the time out of a hectic schedule and committed to one. I have to say that it is a lot of fun and everyone who gets the chance should try and go to one. It is fun, you get to meet new people, and you really can go wild with ideas and do whatever you want. My only advice – keep it really simple because even if you think it is simple, it won’t be simple enough for the time you have. 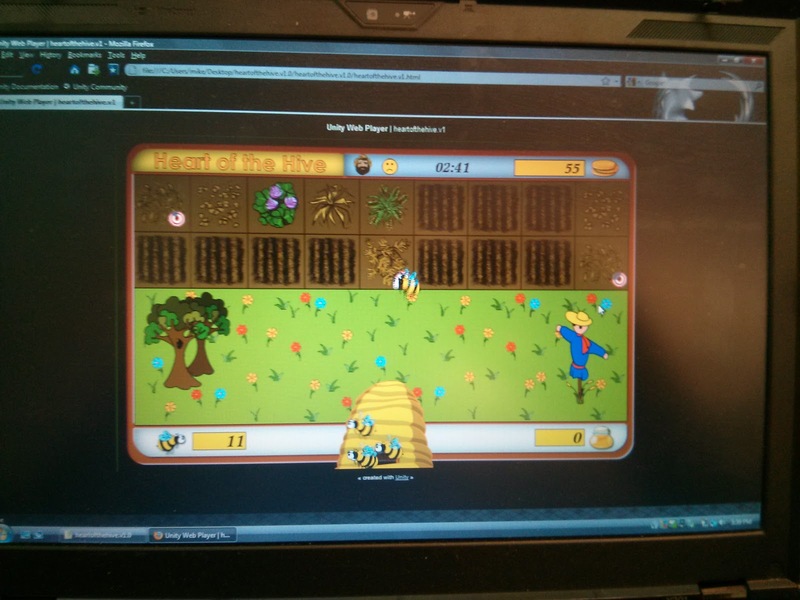 So, I got together with a friend, Miles Benjamin, and we pitched a game about bees! I had recently read another article about studies in the EU connecting a particular pesticide with something called Colony Collapse Disorder in bee colonies. 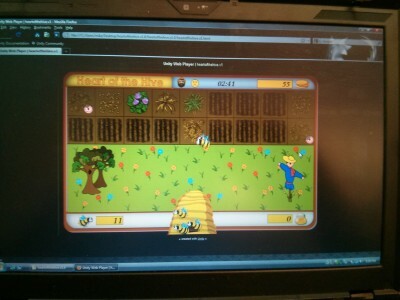 After talking about this and bees in general we decided a bee hive management game sounded good. Especially one that somehow taught about the importance of bees in crop pollination and the problems with CCD. 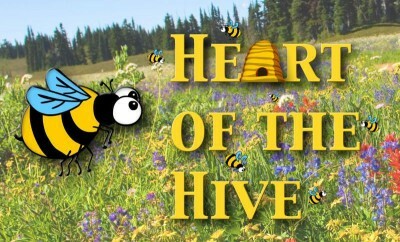 Heart of the Hive, which was of course built using Unity, was the result of that idea and the excellent work of us and three other talented folks. 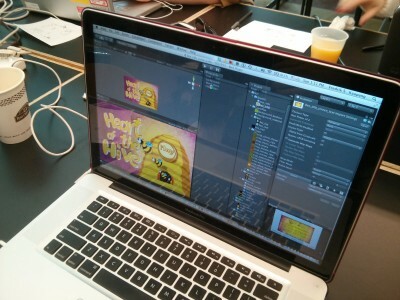 You can find all the details on the GGJ2013 site, including a download for the game and pictures and video of the team. 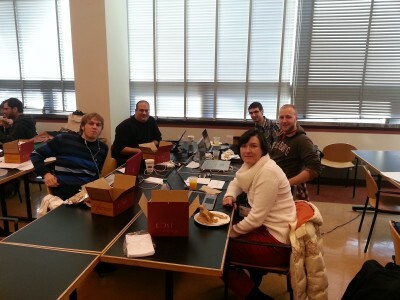 There is also a video of the MIT GGJ 2013 presentations and we are about 54 min in. 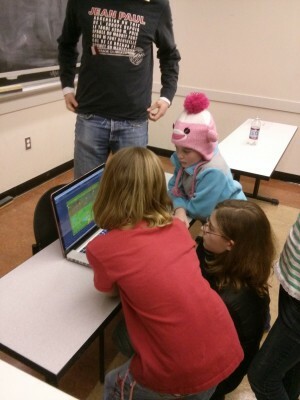 The pictures are of the game and the team. 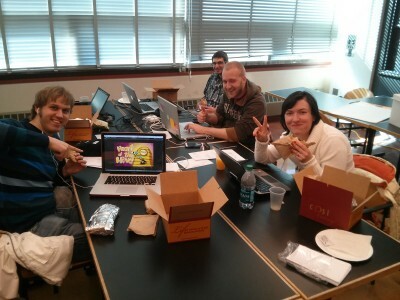 The last one is of our friendly play testing team at the jam. There was much giggling going on in that picture! You can play the game from the link at the bottom of the page – our artist on the project Dina, was kind enough to host it there. So, that is it. I would recommend game jams to anyone and will definitely be doing more of them myself. And please check out the truth about game jams before going – this wisdom was supplied by my good friend Caleb at Part 12 Studios. Enjoy! Tagged bees, colony collapse disorder, global game jam, heart of the hive, mit, unity.